President AbdelFattah al-Sisi has extended for an additional three months the state of emergency as the army continues its operation in the Sinai in a bid to clear out the restive Peninsula from jihadist presence. 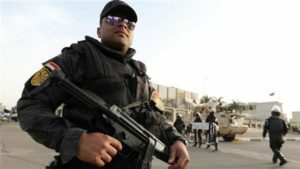 The extension was announced by a presidential decree, Saturday, the same day militants staged an attack against a military base in central Sinai. The militants, wearing explosive belts, blew themselves up as they tried to infiltrate the base, killing 30 soldiers and injuring 40 others, according to a medical source, while the army said eight soldiers died in the attack and 14 militants were killed. “The armed forces were able today to foil a large terrorist operation,” the military said. Al-Sisi imposed a three-month state of emergency following two suicide bombings, which struck two Coptic Christian churches on Palm Sunday. The new extension comes amid a wide scale military operation in the Sinai aiming to weed out terror groups including the Islamic State group (IS) posing permanent threats to the army and Coptic Christians. The operation, launched in February, has cost the lives of more than 100 militants. Written by: KanelkaTagba on April 16, 2018. Posted by KanelkaTagba on Apr 16 2018. Filed under Headlines, World News. You can follow any responses to this entry through the RSS 2.0. Both comments and pings are currently closed.